Sovereign Wealth Funds - Saviours or Harbingers of Economic Apocalypse? The Mega Picture - Sovereign Wealth Funds (SWF's) are being hailed as the saviours of the financial world, but in reality are more akin to harbingers of the economic apocalypse for countries such as the United States and United Kingdom. The SWF's have been stepping in of late with tens of billions in financing and investments into the cash starved US banking and finance sector with financial institutions such as Citicorp selling off large chunks every other week to funds such as that to the Abu Dhabi SWF at 4.9% of the company for $7.5bn on a fixed yield of 11%, the terms are far more favourable than offered to domestic investors. Most recent speculation is that Rio Tinto maybe inline for a chinese SWF bid of as much as $150 billion. As petro and trade dollars flow into these SWF's, we will find increasingly larger and larger slices of important US and western world capital producing infrastructure flowing into the hands of asian and the middle eastern government controlled funds as part of a multi-pronged strategy. The effect of which is literally to gradually transfer sovereignty of the United States to these countries. Whilst there are many arguments as to the value of sovereignty to the average citizen given the observed quality of the democratic institutions where as little as 50% actually turn out to vote, and further diminished by suspected corruption in the voting process such as hanging chads and denial to thousands of democratic black voters in Florida during 2000. 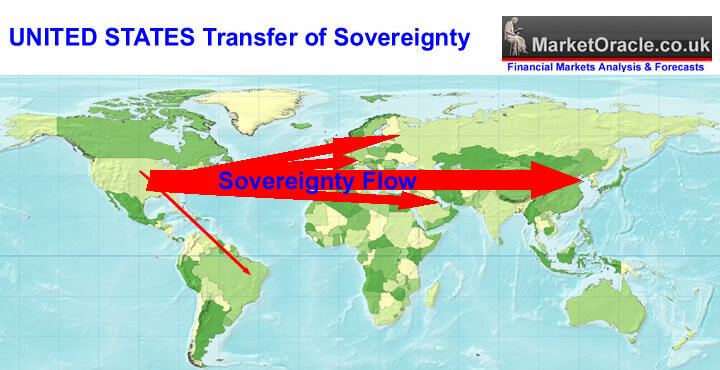 The transfer of sovereignty has consequences that could be deemed to be permanent and irreversible. 1. Transfer of manufacturing base eastwards. 3. Securing control of energy and mineral resources. 5. Investment in prime western companies in the West via SWF's. 6. 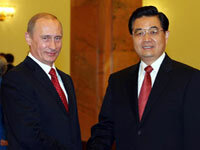 Transfer of western commercial and financial expertise eastward. Whilst trillions of dollars flowed into US government bonds to support the dollar, the US government and Fed were able to effectively manage the influence of bond holders via monetary policy i.e. to maintain the US economy and corporate infrastructure via foreign financing in the form of lower domestic taxation, corporate favourable laws and foreign policy. However the SWF's are invested in assets that are priced to fluctuate inline with profitability and the value of the underlying assets such as mineral and energy reserves, therefore are less influenced by monetary policy and the exchange rates then the bond markets. As SWF's buy up hard assets, these resource and technology corporations and banks are increasingly going to come under the influence of the sovereign wealth funds, which have their own agendas at work based on national self interest. The amount in SWF's continues to grow at an astonishing rate as the giant US deficit of $700 billions continues to feed their coffers. Current estimates put the funds at more than $ 3 trillions and growing as more of the trade surpluses flow directly into the funds. The SWF's are by and large run by a collection of rogue states - dictatorships and pseudo democracies. Japan should be of special interest for it has the financial assets and foreign currency reserves to eclipse all of the above, and could if it chose to create a $2 trillion SWF. Therefore current major funds of $3 trillion are expected to grow to more than $4.5 trillion by the end of 2008 with similar continuing annual growth as the value of underlying assets appreciates in addition to new additional funds. Already the SWF's have bought the oil chiefdoms of the middle east, continuing security against democratic influences or outward threats such as that posed by Iran and thus continue to control the vast oil revenues of hundreds of billions a year amongst a few thousand princes that run the countries as an institutionalised mafia and therefore these funds could be better named as sovereign mafia funds. For the trade and resource dictatorships and rivals such as China and Russia, the control is is more strategic. Whilst the US leadership in congress, and the presidency is focused on the short-termism and self interest, the former cold war rivals are slowly but steadily eroding the ability of the United States and Great Britain to compete economically, through the process of transfer of manufacturing capacity and jobs over-seas. Whist in the short-term this has benefited the US and Britain through corporate profits due to lower costs, but as we are now starting to witness the gain is temporary, as it results in chronic economic under performance and hence each year the situation continues to deteriorates. What does this mean for the US and UK ? As part of the multi pronged strategy of the transfer US based assets and the means of production. The key to the strategy is to support the US dollar will for the time being at least, by the likes of China, arab states and Japan , so as these countries can continue to buy US assets and transfer US and British jobs abroad through outsourcing and maintain supply of goods and services to the US consumer in exchange for more dollars to buy more US assets with. However the situation has reached a point that the amount of sovereignty and manufacturing base transferred to date may be so great that even the strategy of supporting the dollar is breaking down. The eventual inevitable outcome is for a sharp fall in the currencies of the UK and USA as a result of market forces so as to diminish the ability of these countries to be able assert themselves economically and militarily across the globe as these countries will no longer have the economic base to do so. Russia being more immature and a late comer to the game, is prematurely eager to demonstrate the impact of the trend towards transfer of sovereignty then China is, hence the increasing noises emanating from Putin's Kremlin. This should be taken as a strong warning of what the future holds as sovereignty continues to drain eastwards. If Russia is this aggressive with a $150 SWF, how will it behave once currency reserves allow it to create a $1 trillion SWF ? The only thing that could save both countries in the long-run is for a sharp severe recession or depression in an attempt to correct the large structural imbalances, so as to halt the drain of sovereignty abroad, but there does not exist the political awareness or will to embark on a route that is in the long-term interests of both countries. Time is running out as we reach a point when banks and major multinationals will seek to do what is in the best interest of their shareholders who's interests are not entirely based on the bottom line but follow national strategies in favor of global dominance of trade, resources and influence. Unfortunately, investors can only follow the money, and thus follow the sovereign wealth funds and in effect act in their favour of the trend towards the transfer of sovereignty whilst the mass of collective media and politicians are obsessed by the war on terror to awake one day to find that the damage done to their countries is far greater than what any series of bombings could ever have done. If the trend continues for the next 5 years then the SWF's are expected to have passed the $10 trillion level, coupled with even more manufacturing capacity flowing east wards. Whilst many analysts recognise the emerging Chinese and revitalised Russian super powers, what they may have missed is the potential of much stronger ties between the two bordering nations which would in effect create a hyper power beyond that of the economic and military relationship between what the US and UK today. It has long been a dream of the Kremlin for stronger ties with the Chinese, who up until Yeltsin's disastrous reign, viewed the Russians with caution due to the far greater military and economic power they represented against a backward underdeveloped China. However now that the roles have been reversed, allows for the possibilities of far greater co-operation between the two states as trade links continue to grow, both commercial and military. The growing alliance between Russia and China is probably going to be initially felt the hardest by Europe as China becomes the natural customer for vast Russian energy reserves whilst Russia continues the restructuring of its economy. Western companies have already felt the wrath of the Kremlin when the oil Production Sharing Agreements (PSAs) drawn up under the incompetent Yeltsin era were torn up. These were inline with many PSA's that western oil companies have adopted in the third world, that guaranteed huge profits for the oil companies, as profits would only be shared once total development costs had been covered and hence the practice of raising costs and thereby denying Russia a share of the revenues. The PSA practice has been taken to a new extreme in Iraq, and undoubtedly to result in major tensions between Iraq and the USA once the country settles down. The experience of PSA's, Iraq and the war on terror are all converging towards pushing the two super powers together. Hence, we expect to see joint muscle flexing from the emerging hyper power in the coming years. Whilst the US and Britain are busy innovating new technologies, the Chinese and the Russians are busy stealing the technologies and so far China bringing them to market at a far more competitive rate than either UK or the US could hope to achieve given the much lower costs of production and manipulation of currencies in support of the huge trade imbalances that feed the SWF coffers, enabling the countries to continue to erode the long-term sovereignty of both the US and UK. MI5 recently sent a letter to 300 UK companies warning them of the threat from Chinese hackers (Times). MI5 director general, Jonathan Evans, warns that many companies are under threat from "Chinese state organisations", and that some have already been the victim of coordinated attacks. Large UK companies such as Rolls Royce and Royal Dutch Shell have both been subjected to "sustained spying assaults" which aimed to steal sensitive commercial information. Similarly Russian espionage of Britain is put at cold war levels Telegraph. In the end analysis, the UK has a partial get out of jail card, which is for the British Pound to join the Euro, but that in itself will entail a great deal of loss of sovereignty in exchange for some limited protection from the dual influence of the trade strategies and SWF investments. Unfortunately the United States does not have either a get out of jail card or be able to respond in any way that would do more harm to the US economy than to the foreign countries that seek to diminish the United States ability to project itself across the globe. It seems the Russians and Chinese amongst others have learned valuable cold war lessons of how super powers can be defeated without firing a single shot. Once the US is incapable of projecting itself across the world militarily so will arise the Russia-China Hyper power from the east, who will pay far less lip service to the morality when deciding on foreign policy interventions than the US. Whilst at the same time the US contends with ever greater domestic issues of stagflation, and debt interest financing, as much of South America and Africa have had to contend with for a majority of the last 30 years. History is littered with similar demise of over extended empires and entities, one of notable note was the fall of the Ottoman Empire during the 19th century, who's fall remarkably resembles the present day trend of US and Britain. Then the over-extended Ottoman empire had ratcheted up a phenomenal amount of public debt in the aftermath of the Crimean war and in financing construction of the major projects such as the Suez Canal. 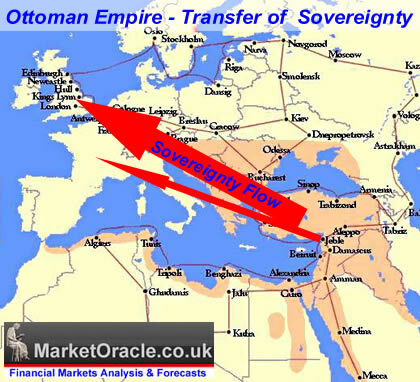 With interest payments running at 50% of GDP, the empire was forced to sell off its best revenue producing assets, such as the Suez Canal to Britain, much as Sovereign wealth funds are buying up the best revenue producing assets in the US and UK today. The sovereignty shifted from the Ottoman empire to Western Europe, which eventually led to much of the once mighty Ottoman Empire becoming mere colonies of Western Europe. What does this mean for Investors ? The key signal is to follow the SWF's into areas that they are targeting (excluding US treasuries), and which are confirmed by fundamental analysis which continues to be the resources sector and more recently the banking sector as well the technology sectors. Also investing in the domestic economies of Russia and China look set to continue to present good long-term growth prospects as both countries and central asia come closer together economically. We have yet to see if SWF's investments in much of the African continent will amount to any significant change in terms of those countries fortunes and investment growth prospects. For more on the impact of the sovereign wealth funds subscribe to our free weekly newsletter. Copyright (c) 2005-08 Marketoracle.co.uk (Market Oracle Ltd). All rights reserved. I've googled "hanging shads" and found a lot of lamp shades! Simply tax heavily the foreign controlled companies to force monetary losses or not allow foreign nationals into the United States.They should have used dollars to buy our products made not the infrastructure to make them plus all mineral and natural resources with the real estate beneath shoud be owned by Americans in common.Make a law that they(foreigners) must sell within a year or they automatically lose ownership anyway. The USA is in its end of empire phase. Unfortunately most Americans are in a state of total denial and cannot / will not believe that their time at the helm is over. The latest economic gloom worldwide is largely a production of US Corporate greed , something also typical of the last days of Rome, Athens , Constantinople etc. Read your history boys , there is a whole new world out there and the balance of power is shofting might fast. 30 Jun 08, 08:01 Saudi SWF ? "Saudi Arabia plans to merge current investments into a new sovereign wealth funds that could have a value of $1000 trillion by the end of 2008"
The Ottoman Empire never invested in the Suez Canal. By the time a modern canal was to be built it was in a de facto independent Egypt with European Capital. In any event the empire had been in a steady decline since 1632. This article is generally littered with historical and logical fallacies.